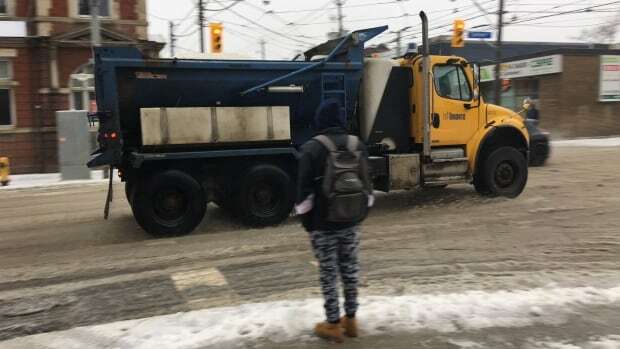 City officials are addicted to salt trucks instead of plows to clear Toronto's ice-laden streets on Sunday, as southern Ontario is turning freezing rain. Barbara Gray, chief of Toronto's transport services, stated that this attempt is to prevent floods when ice builds begin to melt when temperatures jump on Monday. "Our interest is to ensure that the catch basins are kept clean so that when we have floods and further rain that happens later in the day and overnight and tomorrow, the catchment bases can do their jobs," she said. The frosty rain is expected to turn to rain late sunday afternoon and "may sink heavily sometimes", according to Environmental Canada. Rainfalls between 20 and 25 millimeters are predicted, and up to 35 millimeters can fall on monday mornings. Flooding is possible due to this on roads and low-lying areas, according to Toronto and the Regional Conservation Authority. "If you plow all this slush and all the frozen ice pellets on the side of the road, it dramatically increases the risk of a real flood problem if we get tough rain later," Mayor John Tory told reporters Sunday at the City Center for Acute Handling . James Kilgour, director of the Toronto Toronto Agency for Acute Management, said he did not know any flood in Toronto than due to the storm. But the city is still under a flood guard. Meanwhile, about 80 salt cars hit the city streets on Sunday morning, Gray found, but only 30 were equipped with plows. During peak winter weeks, the city usually has access to approximately 200 salt cars, she said. "We definitely have fewer plows," she said, declaring city workers comfortable with the level of equipment on the roads. "Even when we have access to the number of equipment during the high season, we do not always use them. We always have the right size of the number of vehicles we have based on the event." Tory confirmed that the city is "well-equipped" to handle the precipitation from the storm, despite the fact that the remaining winter contracts for non-urban plots and salt trucks end at midnight. "Many have raised questions about plowing. The plow has been made on the highways in accordance with city standards for weather events," he said. Toronto police saw an increase in the number of individual vehicle collisions on Sunday afternoon due to "slippery conditions." Const. Clint Stibbe, spokesman for the Toronto Traffic Service Attorney, demanded that cyclists, pedestrians and drivers should clear the roads, if possible, until the storm passes. Drivers have lost control, turn on other vehicles, crash in poles and shields and get stuck on ice or hills, said Stibbe. "The number of vehicles stuck is almost as common as the number of collisions," he added. Ontario Provincial Police reported 150 crashes in the Greater Toronto Area. Sergeant. Kerry Schmidt, spokesperson for the OPP Motorway Department, predicts road conditions "deteriorating all day" and urged drivers to cancel all non-essential travel. "It's not worth it," he told CBC Toronto. Tory echoed this and urged "those who do not have to go to work or for other emergencies, please stay away from the roads or use public transport."